Tell me a bit about yourself and how you came to write this book. I am a psychologist, who for has many years worked at two Polish universities and two in Germany. However, amassing points for publishing research on problems of little significance, conference ‘tourism’, and scrambling up the academic career ladder are not what I wanted to devote my life to. So I began to write books popularising psychology and to work with business. 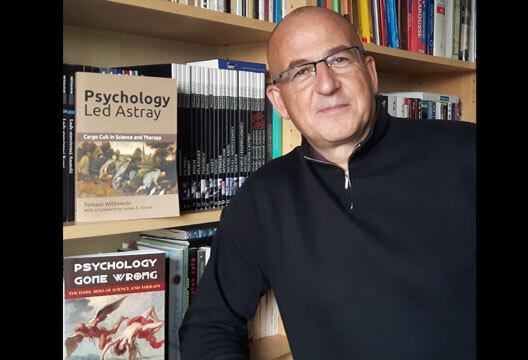 About 10 years ago I decided to write a modest book devoted to some of the myths prevalent in the teaching and understanding of psychology which I had notoriously come up against. This was partly for my own benefit, to categorise and brush up my own knowledge. It really was intended to be a modest little book, but during the course of writing the amount of material increased at an alarming rate as I uncovered more and more distortions and pseudoscience in what we usually call psychology. When the book had already reached over 400 pages, and I had used barely a third of the available material, I decided to publish it as Psychology Gone Wrong: The Dark Sides of Science and Therapy, the first volume of a trilogy. Psychology Led Astray is the second volume of this trilogy. When you see blatant deception being practised on innocent and gullible people, and how these fraudsters go unpunished, you have to ask yourself – how on earth is this possible? Why does nobody expose them? Why, instead of condemnation, these people are treated with respect and admiration in society? That’s when it becomes necessary to expose them and show that the emperor has no clothes. I don’t know how to combat these fraudsters, but I can write (at least my readers tell me so), so that’s why I wrote a book about it. What I’m about to say may seem unpolitical, but it’s honest. Uppermost in my mind were negative emotions – anger and a rejection of injustice – and only later came compassion for all those who had been damaged by dishonest psychologists and psychotherapists. What sets this book apart from other books in this field? Most authors today attempt to create their own original concept and sell it to their readers. As a result, our discipline resembles a garden choked with weeds, in which each gardener looks after his own plant and it is difficult to see which of them is useful. The ‘weeds’ described in my book include the use of unproven or even harmful psychological therapies, theories formulated on incomplete or sometimes faked results, and instances where overlapping theoretical constructs can lead to misunderstandings or confusion. This book is a guide to that garden, showing which plants are weeds, which are edible, which are medicinal and which are decorative. In contrast to many others, this book helps to clean up the garden. Which books have had a strong influence on your ideas or your career? I admire authors with intellectual courage. Elizabeth Loftus is one of them. The publication of her books brought personal death threats, but she nevertheless continued her studies. Another role model for me is the exceptionally professional Scott O. Lilienfeld who, in a series of books, exposed the pseudoscience prevalent in psychology. As can be seen in Psychology Led Astray, Richard Feynman’s approach to science has had a big influence on me, although this mainly concerns books about him or collections of his diffuse sayings, rather than his own publications. And it is impossible not to include Stanislav Andreski, a sociologist of Polish descent, who wrote the intellectually courageous book Social Sciences as Sorcery. Also on the list must be Jeffrey Masson’s Against Therapy, containing a lifetime of experience. And of course Tana Dineen, whose book Manufacturing Victims added to the legions of her enemies. Once I was involved with unpredictable behaviour, also known as ‘protean behaviour’. It should be noted that for the past decades psychology has had to contend with the unpredictable and fight for every percentage of unexplained variance, with unfavourable results. If we were to accept the fact that humans have the ability to generate random and unpredictable behaviour and to use that ability on a daily basis, then we would change our approach to research completely. Instead of seeking answers for what determines such behaviour, we would research why and when we become unpredictable. It might turn out that the nightmare of unexplained variance ceases to be the nightmare of psychology, just as in maths it is possible to describe certain phenomena exclusively by using the chaos theory, in physics we come to terms with the noisiness of elementary particles, and in logic we recognise Gödel’s incompleteness theorem. I would like to devote the third volume of my trilogy to equally fascinating concepts. - Read Tomasz's guest blog on our Research Digest.